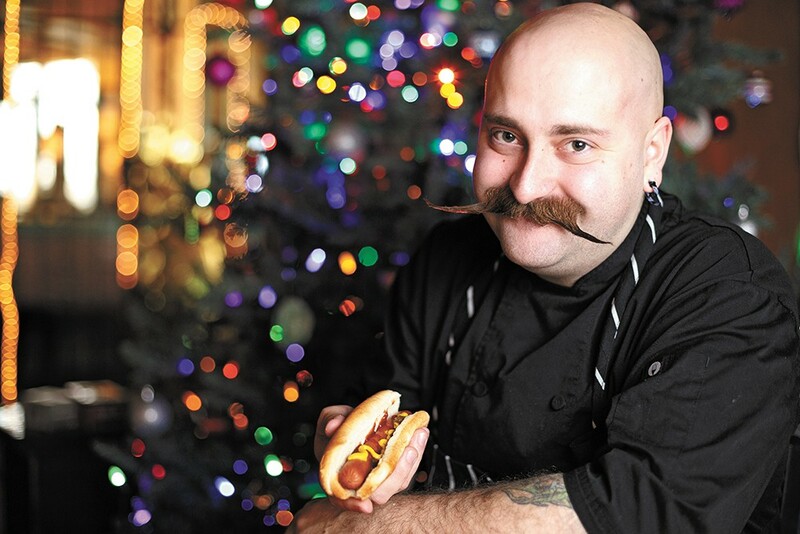 Every Christmas No-Li Brewhouse Chef Branden Moreau grabs a gas station hot dog. Every family has some special holiday dish — a grease-speckled, faded cookie recipe passed down through the generations that's only referenced in the days leading up to Christmas. Others prepare culturally significant dishes, like French-born chef Laurent Zirotti, of Post Falls' Fleur de Sel restaurant. The bûche de Noël, or Yule Log cake, remains one of Zirotti's favorite French holiday traditions. However varied these timeless traditions, from sugar cookies to latkes, Yule Log cakes to Christmas hams, these meals and rituals are what make the holidays for some families. And for several local chefs whose lives revolve around food year-round, Christmas staples range from simple to elaborate, and everything in between. On a brisk Christmas morning 14 years ago, Branden Moreau and his father Terry were making the drive from Spokane Valley to his grandmother's house in the Mead area. Though they'd been saving their appetites for Christmas dinner, Moreau recalls their hunger pangs called for a snack to sate them until dinner. "Of course, nobody was open. We ended up stopping at a gas station and picking up a couple of hot dogs," Moreau remembers. "I thought it was so funny to be eating hot dogs on Christmas." Now, a gas station hot dog is one of Moreau's holiday traditions. "It's something I enjoy, and that makes me smile at Christmas. I hope to continue the tradition with my boys as well," he adds. And while Moreau's grandmother, Nonie Moreau, passed away in 2007, another important tradition he's carried on in the family is to make her no-bake cookies, a treat he fondly remembers devouring each year. On Christmas Day, Bethe Bowman and her partner Anna Vogel, the chef at their Browne's Addition restaurant Italia Trattoria, meld their distinct heritages together to create a Swiss and Latin-inspired feast. Christmas morning starts off with a brunch of tamales, a tradition that goes back to Bowman's Mexican grandmother. "Traditionally, we like to do something simple with chicken, spicy mole sauce, olives and green onions, or vegetarian with roasted poblano peppers and fresh feta," Bowman says. Christmas dinner is prepared in the tradition of Vogel's Swiss family, and usually includes an appetizer of gravlax, raw spiced salmon, along with other seafood such as shellfish and crab. "We love to do different things with it, so it varies with how it's prepared each year," Bowman says. The Bowman-Vogel household's three dogs aren't forgotten on the holiday. A newer family tradition is the special Christmas dinner Vogel prepares for their dogs Wanda, Luc and Milou — a chicken stew with rice, peas and carrots, topped with a demi gravy. Growing up in southern France, Laurent Zirotti's family's Christmas cuisine traditions were elaborate and decadent. He's carried on many of these traditions since coming to the U.S. 15 years ago, and some of the dishes are incorporated into the seasonal menu at Fleur de Sel, the Post Falls restaurant he owns with his wife Patricia. In France, Zirotti says Christmas is largely centered around eating, and he likens it in many ways to the food-centric Thanksgiving holiday. Before midnight Mass on Christmas Eve, most French Catholic families prepare a simple dinner, served cold at around 9 o'clock, of dishes like oysters, snail, foie gras, shrimp and scallops. "Then we'd go to Mass and come back, and after mass was when you do all the desserts, including the bûche de Noël," Zirotti says. The filled sponge cake is rolled into a cylindrical shape, then decorated to look like a log. For a French Christmas dinner, the main course is usually goose or a large roasted chicken stuffed with chestnuts, accompanied by a long list of side dishes including more shellfish and foie gras.